Automatically generate SharePoint documentation. Free 30 days trial! There are various ways we can create our own custom master page. Like you can use Visual Studio 2010 and also you can go for SharePoint designer 2010 to create your custom master page. Before doing anything you should be very clear wether you really need a custom master page from scratch. Because it is very much necessary to put the content placeholders in appropriate areas. Because it should not affect the performance issue also. Since Microsoft already tested all the out of box master pages, so it is always a good idea to copy the existing master page and modify within that. So here we will use one of the existing master page V4.master and use that to create our new master page and we will user here SharePoint 2010 designer. It will show all the master pages. Here right click on the V4.master and then copy and paste it in the same directory. And then Rename the master page file name to a valid master page name. It is always recommended to give a project specitic name. Then go for an IISRESET. 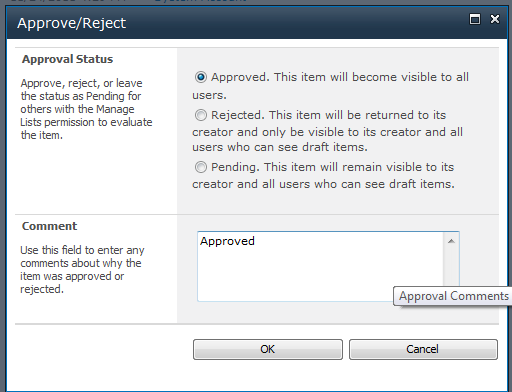 In the next part we will see, how we can publish and approve that and how we can set the default master page from v4.master to our custom master page. For this Open your site in the browser and go to Site Actions -> Site Settings then from the Galleries go to Master pages and page layouts. Then select your custom master page and click on Publish a Major Version as shown in the figure below (ApproveCustomMasterPage.png). Again Select the master page and click on Publish this version and select Approved as shown in the figure below (Approved-MasterPage.png). Now your master page is approved, you can now go to Site Actions -> Site Settings -> From the Look and Feel click on Master Page and then select the custom master page from the master page drop down and click on Ok. Now whenever you will create a new site, it will take your custom master page.